You can host your Access web app on a local SharePoint site or on an Office 365 SharePoint site in the cloud. If you’re using SharePoint locally, make sure you have administrative rights and the URL to the SharePoint site. To begin, connect Access 2016 to your Office 365 account. Click Sign in to get the most out of Office near the right end of the screen. 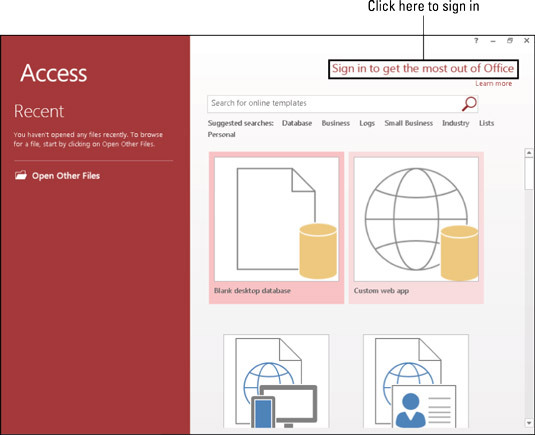 Click Sign In to connect Access 2016 to your Office 365 account. Type the email address associated with your Office 365 account and click Next. Type the password associated with the account and click Sign in. You’ll see the name associated with the account at the right end of the Ribbon in place of the words Sign In. Now you’re ready to create your web app.